Say goodbye to multiple tools, coding, frameworks, test lab, integrations etc. 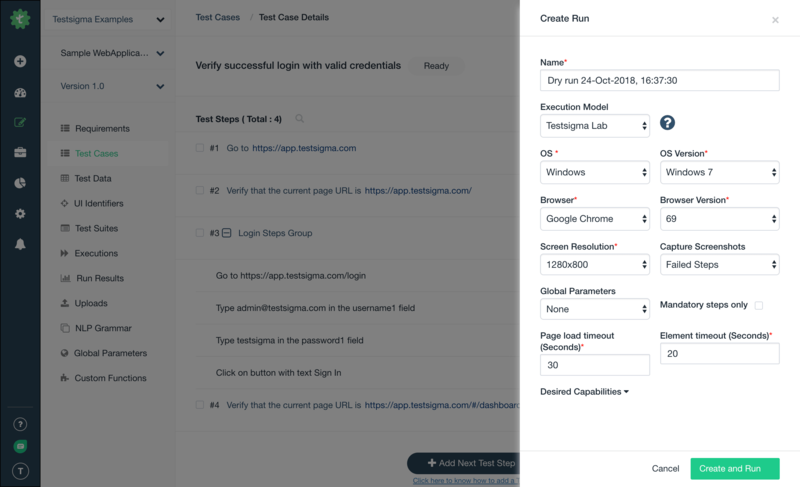 AI-Driven Test Automation Ecosystem for Web, Mobile Web, Android & iOS Apps, and API automated testing. No coding skills required. Why Testsigma for Continuous Testing and Continuous Delivery? Enables everyone including SMEs & QAs to write automated tests using simple English. No coding skills required. Includes all the essential elements required for test automation. No tool and setup required. Lets everyone write automated tests at least 5X faster using simple English. No coding skills required. 1000+ OS/Browser/Version combos and 2000+ real mobile devices to run thousands of tests in minutes. Saves test maintenance time by 70%. Identifies affected tests and potential failures upfront to save execution time & cost. Scalable Test Environments and Parallel Test Executions to run thousands of tests in minutes for faster feedback. Shift-Left approach, CI/CD integration, fast feedback to accelerate the delivery of web & mobile apps. Get Started with Test Automation Ecosystem Includes all the essential elements for your test automation requirements. No tool and setup required. Testsigma is a Test Automation Ecosystem with all the essential elements required for test automation. Sign up for free and get started with test automation on the cloud within minutes. No initial time, cost and resources required. Continuous Testing for Agile and DevOps teams Shift-Left approach, Continuous Integration, fast feedback to accelerate delivery of web & mobile apps. Start automation testing right form your design phase with a Shift-Left approach. Faster and continuous feedback to resolve problems faster in Agile & DevOps. Super fast Test Development using simple English Lets everyone write automated tests at least 5X faster using simple English. No coding skills required. Write automated tests faster than ever using simple English and intuitive interface. Reuse existing step groups. Write Selenium and JS based custom functions to extend Testsigma to your custom requirements. Test Recorder is also available to record your tests. 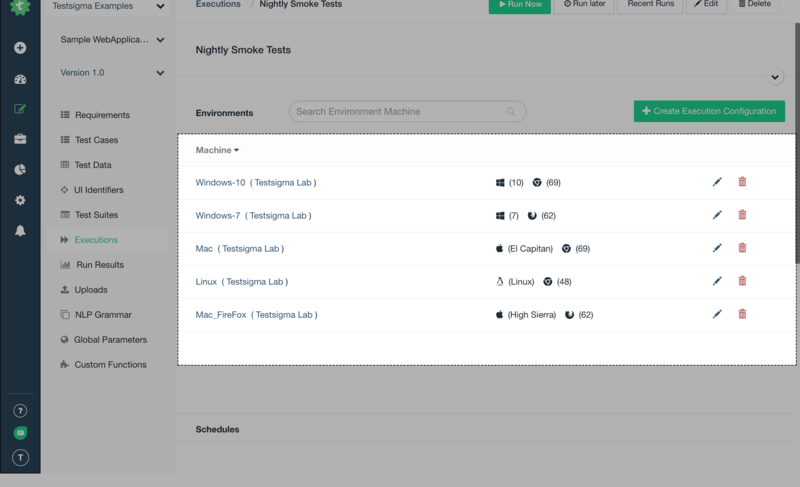 Fully loaded Test Lab On Cloud to run tests 1000+ OS/Browser/Version combos and 2000+ real mobile devices to run thousands of tests in minutes. Create and run Test Suites across different browsers, versions, operating systems, and devices. Run tests on Real Device Cloud with a range of physical Android and iOS mobile devices. Test internal applications on your local devices. AI to reduce Maintenance efforts & Improve Productivity Dynamic Locator Strategy to reduce maintenance efforts by 70%. AI to identify affected tests and potential failures upfront to save execution time & cost. Dynamic Locator Strategy that saves test maintenance time by 70%. Saves time and effort required in manually identifying the affected tests when the application changes. Identifies repetitive and potential failures upfront to save execution time & cost. Creates a test plan automatically based on past result trends. 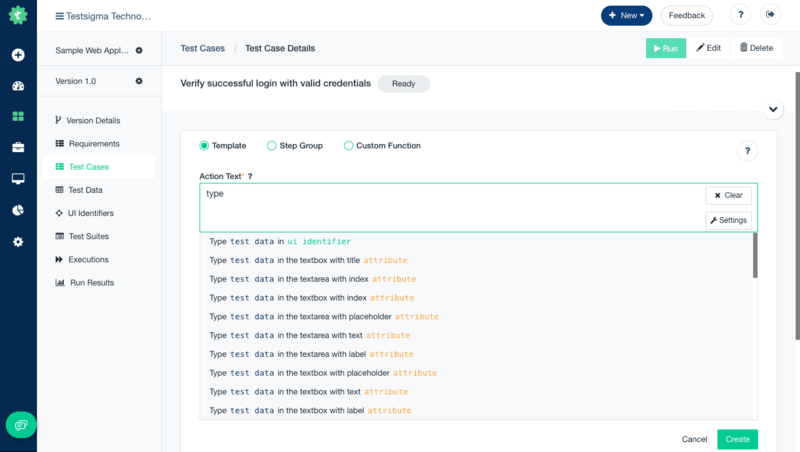 Parallel Test Execution to save Time & Cost Scalable Test Environments and Parallel Test Executions to run thousands of tests in minutes for faster feedback. Parallel Test Execution to reduce regression testing time from weeks to minutes. Scalable Test Lab on cloud with thousands of devices to run your tests in parallel for faster feedback in Agile and DevOps. Automate Web applications using simple English and run tests on different operating systems, devices and browsers for cross browser testing and cross device testing. Automate RESTful APIs using simple and intuitive interface. Compare response headers and response body in any way you want. 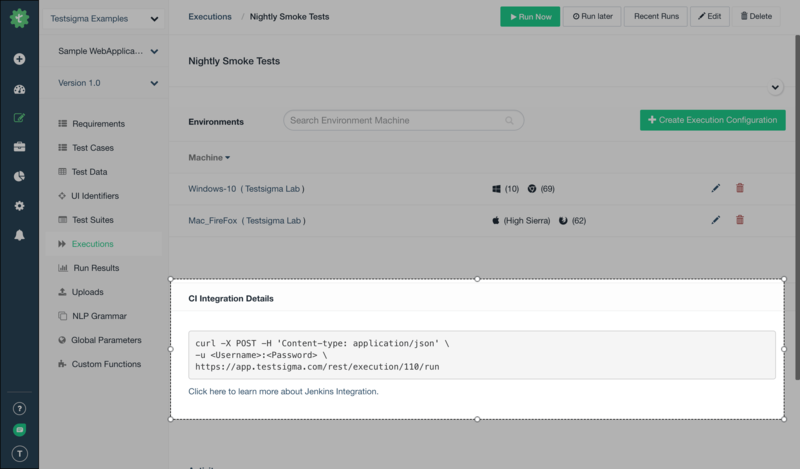 Automate Android Web, Android Native, iOS Web and iOS Native applications using simple English and run tests on mobile devices on cloud. No Programming. In-built CI/CD and DevOps Support. 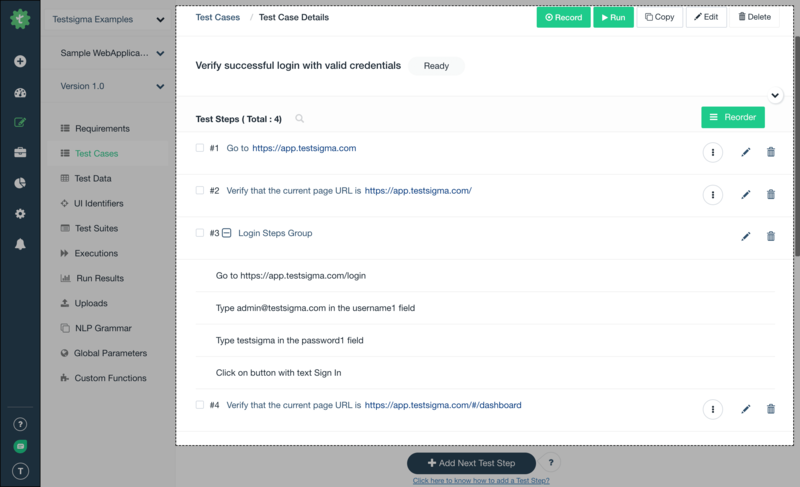 Automate Web, Mobile, and API Testing. No tool, setup, and ramp up time required. Sign up for free and get started with test automation on the cloud for continuous testing within minutes. Write automated tests for Web applications, Mobile apps and APIs at least 5X faster using simple English. No programming knowledge required. 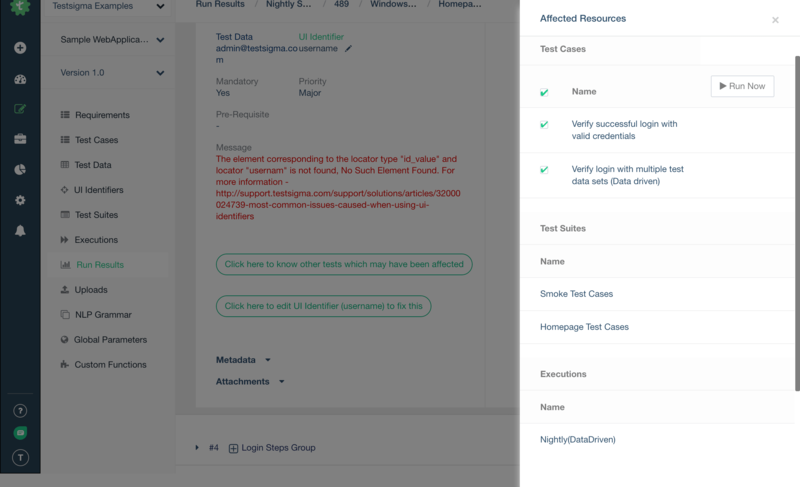 Parallel Test Executions to reduce regression testing time from weeks to minutes. Inbuilt test lab with 2000+ OS/Browser/Version combos and real mobile devices on the cloud. Allows users to visualize data in many forms: summary reports, charts and timelines. Can easily slice, dice, and organize the most important information. Ready for Continuous Testing with a Shift-Left approach for fast and continuous feedback in Agile & DevOps. No initial time, cost and resources required. Reduces maintenance time by 70%. Identifies affected tests, repetitive and potential failures upfront. Use Testsigma's On-Demand Test Automation Expert Services to automate your tests right from day one at just $899/month. Chat with our experts to know more details. Talk to our dedicated Test Automation Architects & DevOps Engineers available almost 24x7. Do you want us to automate a few tests for your preferred application to show you the time, cost and resources you can save using Testsigma? Chat with our Test Automation experts to share your automation requirements, and see how you can achieve test automation ROI immediately, instead of years. Unified cloud platform for Web, Mobile Web, Android Native, iOS Native apps and Web Services. Bring all your manual and automation teams together. Increase the reusability and maintainability with Step Groups and Centralized Object Repository. Team Collaboration to share all common resources. Enable your manual testers, SMEs, developer and others to contribute for automated testing by allowing them to write automated tests using simple English. 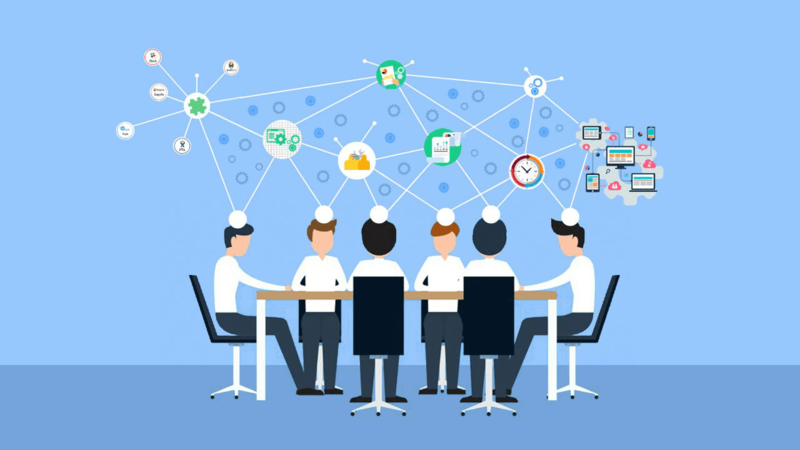 Bring all your manual team members and automation team members together into a single platform for better test coverage and resource utilization. Personalized Dashboard to see recent activities and pending/upcoming tasks to quickly get to immediate tasks. Automation testing tool to plan, design, develop, execute, analyze and report your tests. 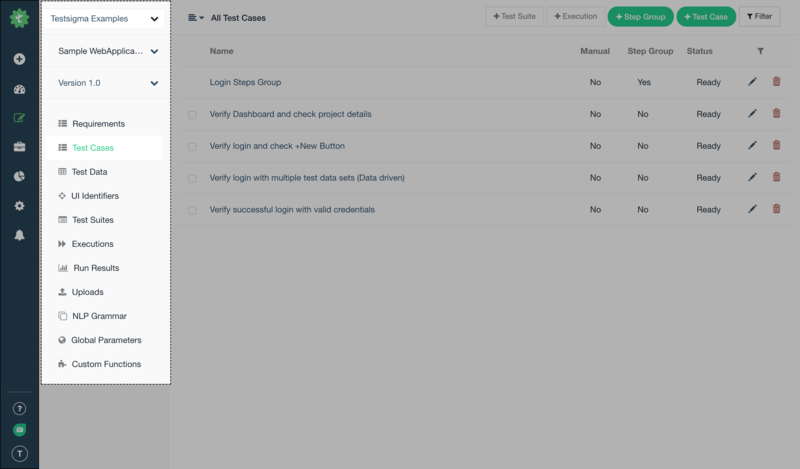 Automated testing tool to provide greater agility to both functional and test automation teams. Test automation is not just about writing automated tests. It needs an ecosystem with multiple other tools besides the automation testing tools. Testsigma has inbuilt integrations with Test Management, Bug Reporting, CI/CD, Communication tools to enable continuous testing.